Actually, it didn't work. However, something that did work was the re-uniting of THE CAPTAINand FRANK ZAPPA a few months ago for a tour and an album, “Bongo Fury”. To mark the occasion, MILES recalls the duo's strange collaborations in earlier times. It was 2am and the Captain's face was green in the fluorescent lighting of the 24-hour snackbar at T.T & G. Recording studios. The edges of the formica-topped tables were serrated with cigarette burns. The room was overlit and bleak. The microwave oven emitted a low hum. “I'm feeling a little tired.” He looked it. “We were seeing if Don's voice could break a window,” I explained, but already Don was thinking about something else and Frank's sudden entry seemed to have disturbed his chain of thought. “Come and listen to this track,” said Zappa. “It looks like we'll be able to put your vocal on tonight.” But Don didn't think so. His voice was not in top form and it wasn't till later that he sang “Willie The Pimp” so nice. Frank was recording “Hot Rats” and Johnny Otis was leading the band: Otis stamped his foot ferociously, just ahead of the beat, revealing beautiful black silk socks held in place by suspenders. His late '50s Tony Curtis hairdo, oiled, black as a Lincoln Continental, bobbed staccato with the beat but not a hair moved out of place. A little sweat appeared on his brow as he grinned and grimaced with the beat, leaning over and clapping his hands a fraction of an inch from the drummer's ear. The drummer did not look pleased. Frank's cigarette burned a brown line in the formica. “He's burned them all,” muttered Frank. “You didn't have photocopies?” Frank and Gail talk privately. Captain Beefheart and Frank Zappa were to have a business meeting. Hours went by before they emerged and Frank immediately took Herb Cohen, master of Bizarre business, aside for another one. Beefheart and I took a walk out on the back lawn. Georgia, Frank's Alsatian dog, sniffed around us. It was 4am. “Everyone is out to burn. All artists get burned.” It seemed as if he hadn't really grasped what had been going on at the business meeting at all. He looked worried and distracted. The problem was “Trout Mask Replica”. The Capt. didn't like the way it was being marketed. “They were selling me like a freak alongside that madman Wild Man Fischer and the GTOs.” At the time Beefheart was not even happy about the album itself. In a later interview he said: “Zappa wanted to pretend that he had done 'Trout Mask Replica', on which he had done nothing but go to sleep at the mixing board. “No, he let me have completely what I wanted to do on it. He wanted to make it more, you know the way he is, he wanted excellent recording techniques and stuff but I wanted to do it the way it is so… He threatened to remix that album! He's funny! “At the time I was naive to money, as I am now, and naive to business and whatnot and I would have liked to have taken a lot longer to put that album out, I would have liked to… but I would have probably ruined it if I'd had the time!” He roars with laughter. Zappa invented Captain Beefheart's name around the time that Beefheart moved to Cucamonga to work with Zappa on those two unlikely projects, a film called Captain Beefheart Meets The Grunt People and a rock and roll group called The Soots, an idea they had first kicked around when they were at Antelope Valley High School out near the Edwards Airforce base, north of Los Angeles. 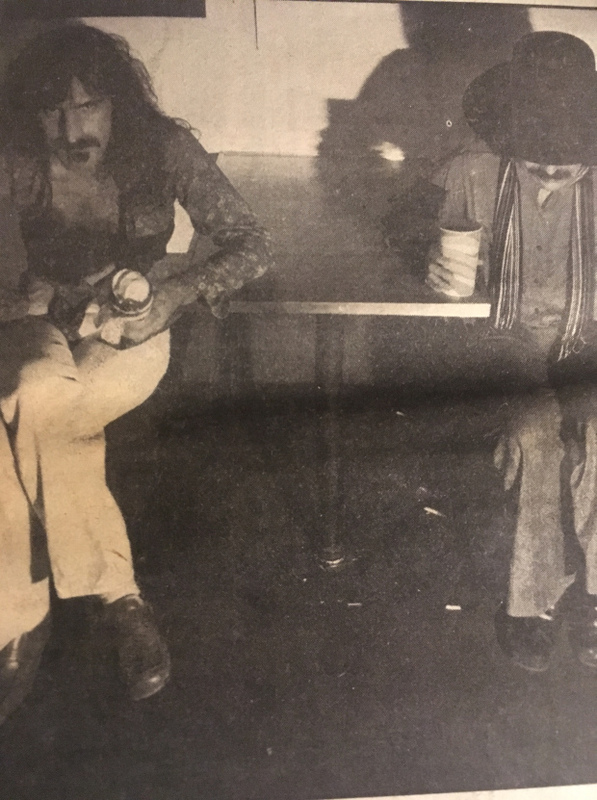 Zappa had a little studio out in the desert, called Studio Z, and here recorded hours of tape of himself and Beefheart playing together – sounding like early Rolling Stones R & B except with Beefheart's powerful four and a half octaves roaring over everything. Zappa was finally busted for making a pornographic tape and went down for ten days. His little five-track studio didn't have much business and he was starving. “I hadn't spoken to him or seen him for five years. I was up painting and writing and doing all those things and I just hadn't come down to Southern California. The minute I came down there we went on a big tour. Ha, that was fun! I'd been with a group for so many years that it was nice to get away and be free again with a very intelligent person. A very old friend, let's see, he's a little older than me. I think one month. He's a Sagittarius and I'm a Capricorn. Zappa's story about the reunion is of course quite different: “He apologised for all the garbagio and asked for a job.” He was auditioned just before Hallowe'en. “He flunked. See, he had a problem with rhythm and we were very rhythm orientated. Things have to happen on the beat.